For many, the commute to and from work is a lengthy, stressful process. According to the U.S. Census Bureau, it takes the average American about 26½ minutes to get to work. That's nearly an hour each day—to work and back—to face traffic snarls and congested highways. 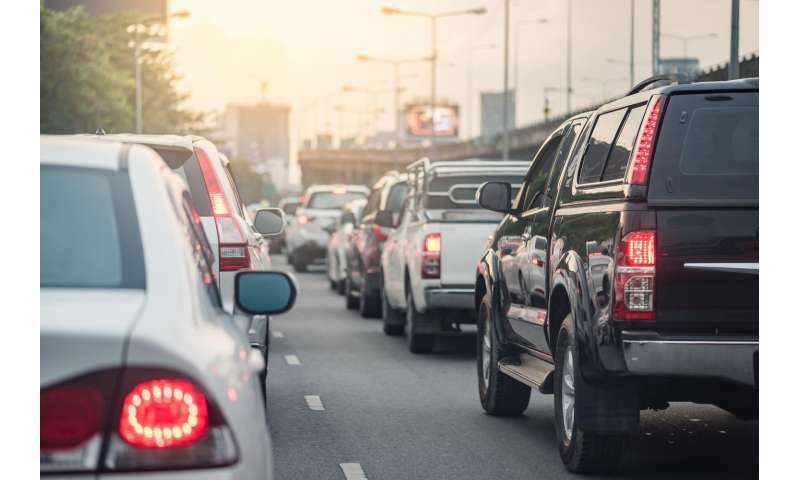 That commute can also be hazardous to your health, exposing drivers to an increased amount of air pollutants that have been linked to a whole host of medical maladies, including cardiovascular disease, respiratory issues and even lung cancer. "We know that traffic generates a lot of pollution, and therefore it's the time when you're traveling in traffic that you can have a disproportionately high amount of your daily exposure to many harmful pollutants," said Anna Leavey, a research scientist at the School of Engineering and Applied Science. "What we wanted to see was: When and where are our highest exposures occurring, and how should one be driving to mitigate the risk?" Leavey and Nathan Reed, a PhD candidate, worked together with PhD candidate Sameer Patel and Pratim Biswas, the Lucy and Stanley Lopata Professor and chair of the SEAS department of Energy, Environmental and Chemical Engineering. With assistance from Biswas's Aerosol and Air Quality Research Lab, they used portable instruments and sensors to monitor and simultaneously measure the pollutant levels of their car's indoor cabin air and the air directly outside of the car during their own daily commutes. That gave them rare, real-world look at pollutant exposure. "As aerosol scientists, we had access to state-of-the-art air monitoring equipment," Reed said. "Once we began measuring inside and outside of the car, and started getting numbers back, we were able to confirm our hypothesis that by controlling our car's ventilation we could mitigate some pollutant risk." Using their simultaneous measurement approach, Leavey and Reed were able to test a number of variables while driving to and from Washington University over a four-month period starting in 2014. Using a dashcam, they were able to identify a given pollutant concentration each time they were: stuck behind a bus or truck, amid traffic on a freeway, stopped at a red light, or driving past restaurants or construction work. They also used different ventilation settings inside their cars: driving with the windows open, windows closed, with fan on, and with the air conditioning on. After crunching all the data, pollutant measurements, and corresponding weather conditions, the researchers zeroed in on the best approach to cutting your risk of pollutant exposure while out on the commute. Using the AC reduced the pollutants in the vehicle by 20-34 percent, depending on the different metrics examined, as well as outdoor concentrations, weather and road conditions. "We found a significant difference between running the fan versus running the AC. The AC is pulling outside air, running through the same filter with the same ventilation path as the fan. But there's one difference: when the AC is operating: You have a cold evaporator that is cooling the air as it passes," Reed said. "This cold surface attracts the pollutant particles, and they deposit there, as opposed to diffusing it into the air you're breathing." When windows were closed, and following a bus, the particle concentration in the outdoor air was 3 times higher than the indoor air. What's more, no in-cabin carbon dioxide concentrations were measured during 75 percent of the journeys made with the AC on. Biswas says the new research, recently published in the journal Atmospheric Environment, "proves that studies such as this can offer insights and provide mechanistic insights. While some results are obvious, certain other findings are not, but more importantly accurate scientific data is essential to back up our results and conclusions. It also indicates that newer cabin filtration or air cleaning techniques are much the need of the day, especially for urban commuters." "The vehicle cabin can be viewed as a buffer, protecting us from the outside air," said Leavey. "While driving with your air conditioning on and windows closed is the most protective thing that you can do, running the AC can decrease your fuel economy. That's why adopting a dynamic behavior modification approach is recommended, in which the AC or closed windows are used when following a highly polluting vehicle, or on the freeway which tends to be more highly polluted. Once you have left the polluted environment, we recommend opening your windows to remove any pollutant build-up from your car. " Would have been nice if they had also tested cabin air filters with activated carbon. f*cking great idea, man! no sh*t! hey, why not run a few tests yourself? I am one of the authors of the paper and we used my car for half of the commutes studied. We decided to use standard filters since that is what we personally use and since they are the most commonly used filters. Future work could definitely look at the benefits of different filter technologies! Future work could definitely look at the benefits of different filter technologies! looking forward to seeing this in a future study! Did your AC tests include normal vs max AC mode? Ban diesel cars, which no one needs, that'll fix a lot of particulate pollution. Also, driving on the highway without AC and the windows down exposes people to sound levels dangerous to hearing. I found that in polluted situations, and if the vehicle is equipped, you can activate the "recirculate" setting to remove the smell of diesel and smoke, etc. I am guessing the inside air, makes several passes across the evaporator heat-exchanger and thus even more particles are removed. "...What's more, no in-cabin carbon dioxide concentrations were measured during 75 percent of the journeys made with the AC on." Carbon dioxide is NOT a pollutant. I am assuming you meant carbon monoxide, which IS a dangerous gas that has several effects on the human body as it builds up. However, the most serious pollutants come from off-gassing of interior plastic surfaces when they get hot, rather than outside pollutants. That "new car" smell is toxic. In my car (2014 Ford Focus SE), I cannot recirculate the inside air, on a medium AC setting. I can only recirculate on the coldest setting. Also, I have no cabin filter. Cabin filters are, unfortunately, not standard issue, on all cars. I really miss the old, cable controlled, inside/outside air damper. That way, I can decide what I breathe and I choose not to breathe the exhaust from cars around me or someone's cigar smoke. One more thought: Yes, you can avoid some air pollution, in your car, by running the AC but you will also create more air pollution, in general, because the AC reduces your fuel efficiency. You are mistaken. CO2 is indeed a pollutant. It is a well known (to most) "greenhouse gas". Different context - not relevant to the issue. CO2 is not going to produce the greenhouse effect inside your car, and up to a point it has no biological effect on a person, so it's not a pollutant here. CO2 levels become important only if there's a major exhaust leak into the cabin and the concentration starts to climb up to the percent range (>800 ppm) , because then it produces disorientation and drowsiness - but the whole situation would be so uncomfortable that you couldn't drive a car like that. "CO2 levels become important only if there's a major exhaust leak into the cabin"
If there is a major exhaust leak, into the cabin, CO2 is the least of your problems. It's the carbon MONOxide that's going to kill you. Freeman Dyson says you're incorrect. And you'd be a fool to argue with Freeman Dyson. CO2 concentrations inside a car do not rise to levels relevant to hypercapnia. Humans can tolerate 10,000 ppm levels for a lifetime, and even at 15,000 ppm you'd have to sit in the car for a month before you risk serious health effects. It takes about 30 minutes to reach 2500 ppm CO2 inside a car with the ventilation completely off. It's simply not a plausible concern. Point being that if you're sitting in traffic and your ventilation system is gulping up exhaust from the car ahead, it's indeed the CO instead of CO2 that's going to cause you problems first. Carbon dioxide is well tolerated, and so it's not a pollutant in this context. But assuming there's no CO, by the time the concentration of CO2 in the car reaches about 8000 ppm, the people are already so uncomfortable that they'll crack a window to breathe. That's because the human breathing reflex is regulated by blood CO2 concentration, so even with enough oxygen available, increased CO2 levels cause increasing discomfort well before the CO2 becomes poisonous.